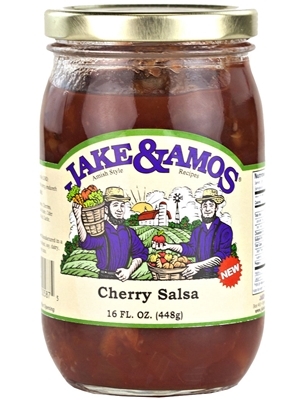 Jake and Amos Cherry Salsa is spicy with a distinctive twist of cherry flavor that is sure to make it one of your new family favorites! Use this salsa with classic tortilla chips or use it as an ingredient in your next soft or hard shelled taco. Ingredients: Tomatoes, Cherries, Onion, Sugar, Tomato Paste, Cider Vinegar, Salt, Citric Acid, Garlic, Jalapeno Peppers. **Good Manuacturing Practices are used to sequence ingredients in our production facility that also processes products containing peanuts, tree nuts, soy, fish, milk, egg, crustacean shellfish and wheat ingredients.